I was asked the other day what "beta" means when we are announcing software updates. November's update to our software for asbestos surveyors, Alpha Tracker, has reached "Beta 4" status, but what does that actually mean? When we're developing software, we often show customers a very early version for their feedback. Sometimes this software is a long way off being complete and this is known as an "alpha" release. Nothing to do with Alpha the software platform or Alpha Tracker by the way...! When the functionality in a piece of software is nearly complete and the final bugs are being found and dealt with, we call the release a "beta". So the release now available in Alpha Tracker is the 4th beta we have released for the November build and our beta testers are giving us feedback now. Please do let us know if you would like to join the list of beta testers. When we're happy that the release is ready it stops being a beta and becomes a final version. Hopefully November's release will be issued at the end of next week by the way and it has some lovely new features. Can't wait! Our financial year has just come to a close (it runs October - September) and so we've been looking back on our trading results for 2013-14 and looking forward to 2014-15. The draft accounts for the year just gone look fine - turnover is up slightly and profit looks OK too. We've had to write off a lot of bad debts, more than in previous years, but new orders and the continued popularity of our asbestos systems (eg Alpha Tracker) and Alpha Anywhere-based apps in general is helping us to consolidate and grow. In fact, we have more employees than ever before now with two new software developers joining us as apprentices last month. Tom and Jack have already made an impact and are working as extra pairs of hands on a number of systems. Finally, we're all very aware that you have a wide choice of software providers. Some of our customers have continued to use and trust us for well over a decade now and we really appreciate your loyalty, business and support. The 2013-14 figures should give you confidence that we are on a safe and sound financial footing and that you can continue to trust us with your business in the future. October 2014's monthly update to Alpha Tracker is now publicly available. This is update SVN855. Incredibly... the October update has 125 new features, improvements and bug fixes to the software since the September update. The video above runs through 5 of the key new features including searching and sorting in the document window which finishes off the improvements to this important aspect of the system and several improvements to the flow of data when performing asbestos re-inspections. This important update to AlphaValidator (v1.0.53 SVN19) gives the surveyor a new opportunity to "sign off" their submitted data before leaving site. AlphaValidator is an important module within the Alpha Tracker family of asbestos software for environmental consultancies. 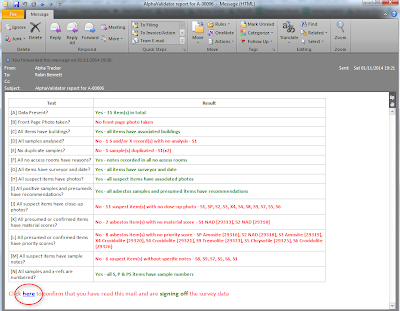 It checks data submitted by surveyors for problems or potential problems and emails them a "traffic light" red/amber/green report as soon as their data is uploaded. Please contact the office if you would like help applying the update. Please note that your copy of Tracker Upload Manager needs to be at version v1.0.172 SVN34 or higher before you apply this update. 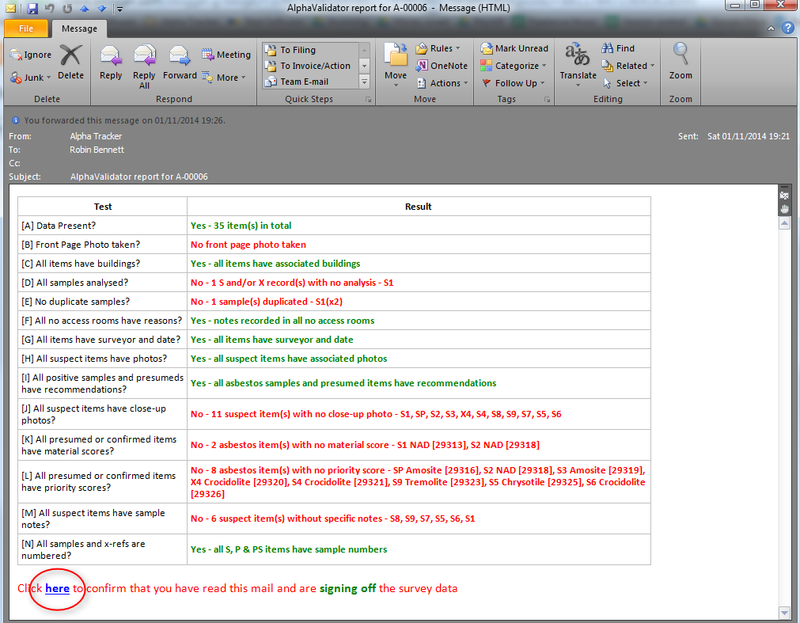 The latest update to Alpha Tracker Document Maker has been released on our website ready for download. This a minor update with improved quotation formatting. Please contact the office if you would like help applying the update to your Alpha Tracker asbestos system. 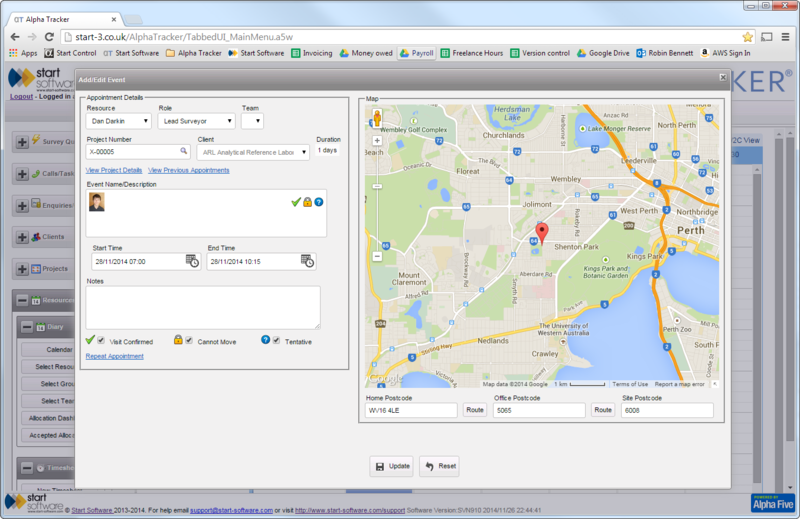 The latest update to Tracker Web Server, the online portal for the Tracker asbestos software system, has been released. - client notes and a new option to allow them to be optionally suppressed on registers. Please contact the office if you would like help downloading and applying the update. We've had a really challenging month on the support desk. Three client systems suffered critical failures in the same week which caused our support call volumes to more than double at the same time that the help desk staff were short-handed due to holiday and illness. We still managed to resolve 91% of high priority calls in time - but the other calls suffered and we dropped to 83%. If you have any concerns, please contact Support Director Elaine Porter on 0845 612 2402. 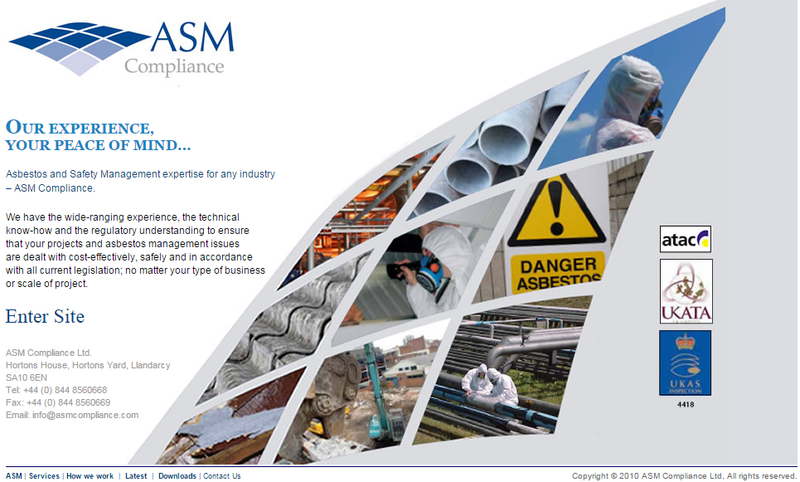 Our latest asbestos consultancy partner - ASM Compliance - has gone live with Alpha Tracker today. ASM Compliance provide asbestos and safety management surveys for all industries and are based in South Wales. Their admin and field staff received their training today to become familiar with Alpha Tracker and Tracker Mobile on their Samsung tablets.